Safety concerns with erythropoietin analogues and intravenous (IV) iron for treatment of anemia in CKD necessitate development of safer therapies. Roxadustat (FG-4592) is an orally bioavailable hypoxia-inducible factor (HIF) prolyl hydroxylase inhibitor that promotes coordinated erythropoiesis through HIF-mediated transcription. We performed an open-label, randomized hemoglobin (Hb) correction study in anemic (Hb≤10.0 g/dl) patients incident to hemodialysis (HD) or peritoneal dialysis (PD). Sixty patients received no iron, oral iron, or IV iron while treated with roxadustat for 12 weeks. Mean±SD baseline Hb was 8.3±1.0 g/dl in enrolled patients. Roxadustat at titrated doses increased mean Hb by ≥2.0 g/dl within 7 weeks regardless of baseline iron repletion status, C-reactive protein level, iron regimen, or dialysis modality. Mean±SEM maximal change in Hb from baseline (ΔHbmax), the primary endpoint, was 3.1±0.2 g/dl over 12 weeks in efficacy-evaluable patients (n=55). In groups receiving oral or IV iron, ΔHbmax was similar and larger than in the no-iron group. Hb response (increase in Hb of ≥1.0 g/dl from baseline) was achieved in 96% of efficacy-evaluable patients. Mean serum hepcidin decreased significantly 4 weeks into study: by 80% in HD patients receiving no iron (n=22), 52% in HD and PD patients receiving oral iron (n=21), and 41% in HD patients receiving IV iron (n=9). In summary, roxadustat was well tolerated and corrected anemia in incident HD and PD patients, regardless of baseline iron repletion status or C-reactive protein level and with oral or IV iron supplementation; it also reduced serum hepcidin levels. Prevalence and severity of anemia in CKD increase with the severity of CKD.1,2 Current treatment of anemia in CKD requires erythropoiesis-stimulating agents (erythropoietin analogues) with intravenous (IV) iron supplementation, particularly in stage 5.2–4 In 2007, the US Food and Drug Administration modified safety language to the label/indication; in 2011 it recommended that hemoglobin (Hb) be further reduced to a target of 10–11 g/dl. Mean erythropoietin analogue doses and Hb levels fell in the dialysis population. The proportion of prevalent hemodialysis (HD) patients with Hb levels <10 g/dl increased from 9% in 2009 to 18%–20% by the end of 20125; this probably contributed to a 30% increase in monthly blood transfusions in the United States in the first half of 2012 compared with 2010. The first 4 months after dialysis initiation require the highest doses of erythropoietin analogue and IV iron use; during this time the mortality rate for the ESRD population is the highest.5 Hepcidin, a key regulator of iron metabolism,6 increases with inflammation and limits iron availability, leading to resistance to erythropoietin analogues. Therefore, safe and more effective treatments are needed for anemia in incident dialysis patients. Roxadustat (also known as FG-4592) is an oral HIF-PH inhibitor (HIF-PHI). By inhibiting HIF-PHs and mimicking the response to a cellular reduction in oxygen levels, roxadustat increases HIF activity and promotes erythropoiesis. The short half-life of roxadustat, along with an intermittent dosing regimen, gives rise to transient bursts of HIF activity, which are sufficient to stimulate effective erythropoiesis. In our previous roxadustat phase 1 and phase 212 studies in patients with CKD who were receiving or not receiving dialysis, roxadustat transiently increased endogenous plasma erythropoietin concentrations, peaking about 10–12 hours after dosing, and substantially decreased hepcidin levels. Herein, we report a phase 2b formal proof-of-concept study of roxadustat in correcting anemia in newly initiated dialysis patients, naive to erythropoietin analogues, randomly assigned to different iron supplementation regimens. The study sought to evaluate exogenous iron requirement and effect of roxadustat therapy on hepcidin. In this study, 24 patients undergoing HD received no exogenous iron supplement, 12 HD recipients and 12 peritoneal dialysis (PD) recipients received oral iron, and 12 HD recipients were administered IV iron. Patients receiving oral iron were dosed per local standard of care once a day or more frequently. The mean±SD daily iron dose administered to these patients was 71±50 mg (median, 50 mg; range, 50–216 mg). Patients randomized to IV iron received 50 or 62.5 mg weekly. Demographic and baseline characteristics did not significantly differ between the HD cohorts (Table 1). Mean baseline Hb for patients enrolled was 8.3±1.0 g/dl. Of the 60 patients in the safety population, five (8.3%) discontinued the study within the first 6 weeks: two because of worsening gastritis and dizziness, one because of withdrawn consent, one because of renal function recovery, and one because of sudden death (suspected acute heart failure, see section titled "Safety") unrelated to study medication. The remaining 55 patients constituted the efficacy-evaluable (EE) population (Figure 1). Patient disposition. Screened refers to the inclusion and exclusion criteria listed under "Selection of Study Population" in the Supplemental Material. FU, follow-up period. *The adverse events were dizziness in the no-iron cohorts and worsening gastritis in the IV iron cohort. ^Recovery of renal function. Most study patients (54 of 60 [90.0%]) were enrolled in Russia. The most common causes of renal failure (all patients combined) were unspecified GN (41.7%), pyelonephritis (21.7%), hypertensive nephropathy (18.3%), and diabetic nephropathy (15.0%). Adherence to the study drug was 99.0% in the safety population. The mean weekly roxadustat dose (administered thrice weekly) during week 12 was 4.3 mg/kg versus 4.0 mg/kg during the first week (starting dose). Mean roxadustat dose requirement did not significantly differ among cohorts at any time point; the mean doses during week 12 were 4.3 mg/kg in the oral iron HD and PD recipients compared with 4.1 mg/kg in the IV iron HD recipients and 4.5 mg/kg in no-iron HD recipients. Overall, four patients had dose frequency reduced to biweekly or once-weekly. Dose exceeded 7.5 mg/kg per week in 2 patients (7.58 and 8.11 mg/kg per week). Starting dose levels and dose adjustments are further illustrated in Table 2. Mean Hb rose in each group during treatment with roxadustat (Figure 2). Mean Hb increases of ≥2 g/dl were achieved within 7 weeks regardless of baseline iron repletion status, iron supplementation regimen, and dialysis modality. A greater Hb change from baseline (ΔHb) was observed in the groups receiving iron supplementation than in the no-iron cohort during the remainder of the treatment period. Mean hemoglobin levels over time are similar through 7 weeks for all treatment groups and thereafter lower for the no-iron vs oral or IV iron groups. Data are for the EE population using last-observation-carried-forward imputation for missing data and are expressed as the mean±SEM Hb value at each time point. Week 0 (baseline) is the mean of three predosing Hb values. *P<0.05 in comparisons between no-iron cohort to the pooled iron cohorts based on the repeated-measures analysis of covariance model with baseline Hb and iron repletion status as covariates, using all observed data collected during treatment. Overall, the mean±SEM maximum ΔHb (ΔHbmax) was 3.1±0.2 g/dl among the EE patients. The mean±SEM ΔHbmax was 2.8±0.2 g/dl among HD patients who did not receive iron. ΔHbmax for HD patients receiving oral iron was similar to that for patients receiving IV iron: 3.4±0.5 g/dl and 3.5±0.4 g/dl, respectively. 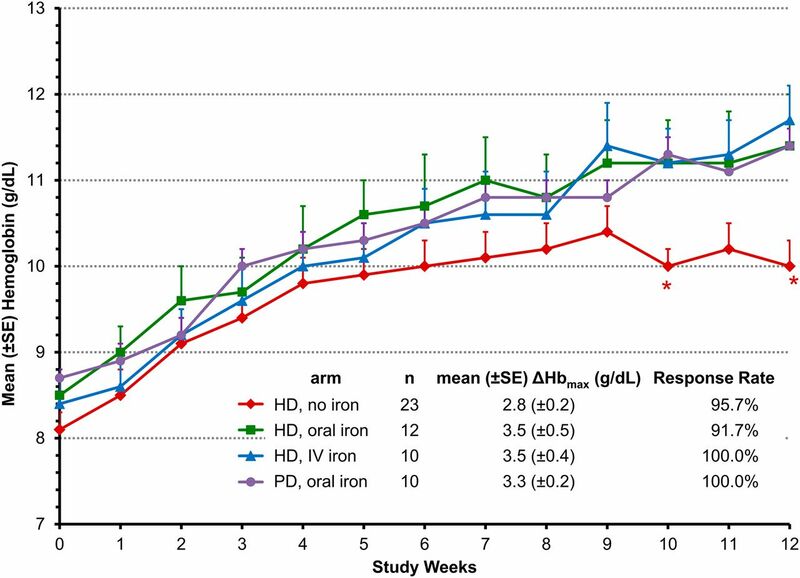 The mean±SEM ΔHbmax was 3.3±0.2 g/dl among PD patients receiving oral iron. Hb response (Hb increase by ≥1.0 g/dl) was achieved in 96% of all roxadustat-treated patients (Figure 3). The median time to Hb response was 3 weeks in each cohort. The rates of increase in mean Hb during the 12-week treatment period and the mean Hb levels during the last 4 weeks (HD oral: 11.2 g/dl; HD IV: 11.4 g/dl; PD oral: 11.2 g/dL) were similar between oral and IV iron cohorts (Figure 2). Cumulative Hb responses are similar among the cohorts. Data are for the EE population. Hb response was defined as the first Hb increase from baseline of ≥1.0 g/dl. Median time to first response was 3.0 weeks in all cohorts. Two patients received red blood cell transfusions for symptomatic anemia. Both cases were associated with possible gastrointestinal bleeding or gastritis; one occurred at week 2 of treatment in a patient with a history of gastritis and duodenal ulcer, and the other case involved gastrointestinal bleeding after the end of treatment. The latter case is discussed in detail in the "Safety" section. Hyporesponsiveness to erythropoietin analogues is associated with inflammation13,14; however, patients with elevated C-reactive protein (CRP) responded as well to roxadustat as did patients with normal CRP levels, regardless of iron supplementation (Figure 4). Furthermore, mean roxadustat dose requirements in the last 2 weeks of treatment were not influenced by baseline CRP (Figure 5). ΔHbmax during last 10 weeks of treatment (g/dl) is independent of baseline CRP level. Data are for the EE population. Baseline CRP was defined as the last value before the first dose administration. LR, linear regression on log(CRP) with adjustment of treatment cohort, baseline Hb, and baseline iron repletion. ΔHbmax versus log(baseline CRP): regression slope on log(CRP) = −0.31 (P=0.30). 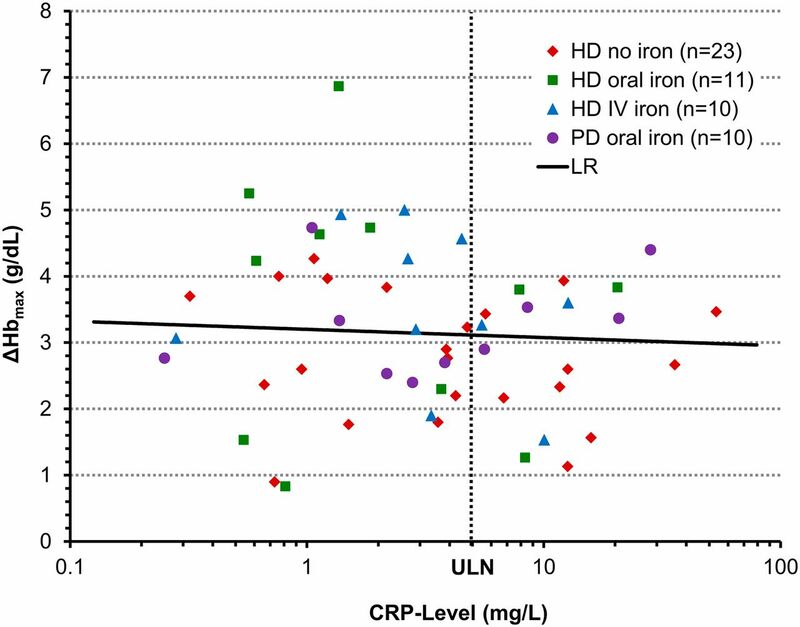 All patients with CRP greater than the upper limit of normal (ULN=5 g/ml) responded to treatment. Weekly roxadustat dose during the last 2 weeks of the treatment period is independent of baseline CRP level. Data are for the EE population. Baseline CRP was defined as the last value before the first dose administration. LR, linear regression on log(CRP) with adjustment of treatment cohort, baseline Hb, and baseline iron repletion. Maintenance dose was defined as total dose during last 2 weeks of treatment. Maintenance dose versus log (baseline CRP): regression slope on log(baseline CRP) = −0.43 (P=0.38). ULN, upper limit of normal (5 ng/ml). By 4 weeks, mean hepcidin levels decreased in EE patients in all iron regimen groups (Table 3). These reductions from baseline were largest in HD patients receiving no exogenous iron (−67.7±12.0 ng/ml; P<0. 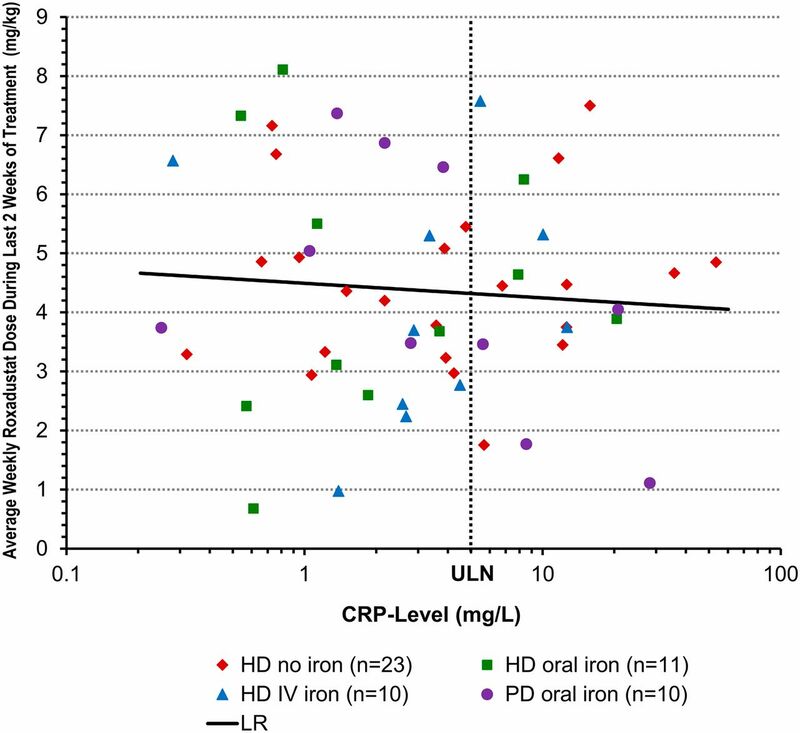 001), somewhat smaller in HD and PD patients receiving oral iron (−56.3±19.2 ng/ml; P<0.008), and least in HD patients receiving IV iron (−34.7±12.6 ng/ml; P<0.02). At end of treatment, hepcidin reduction from baseline continued to remain significant in the no-iron and oral-iron cohorts but not in the IV iron cohort, in which 42% of patients had higher hepcidin levels at end of treatment than at baseline. At end of study, hepcidin rebounded significantly beyond baseline in the IV iron cohort, remained lower than baseline in the no-iron cohort, and returned to baseline in the oral iron cohorts. Neither transferrin saturation (TSAT) levels nor reticulocyte Hb content changed significantly in the groups receiving oral or IV iron, but both decreased in those not receiving iron (Table 4). Similarly, serum ferritin levels did not change significantly in the groups receiving oral or IV iron in the HD patients but decreased in those not receiving iron. Transferrin and total iron-binding capacity increased in all groups. Roxadustat was well tolerated in the safety population. Treatment-emergent adverse events were reported in 30 (50%) of all patients in the safety population (Supplemental Material). The nature and severity of the adverse events was typical for patients undergoing HD or PD. Adverse events with maximum severity characterized as severe (n=4), life-threatening (n=0), or fatal (n=2) were reported in 6 (10%) patients. Hypertension necessitating increase or change of antihypertensive medication was the most frequent treatment-emergent adverse events reported in a total of 6 (10.0%) patients (four HD and two PD recipients), followed by decreased TSAT in four (6.7%) patients, three of them in the no-iron HD cohorts. The incidences of all other adverse events were ≤5%. Two patients had clinically significant abnormal electrocardiograms at baseline, and these remained abnormal by end of treatment. One patient developed a first-degree arteriovenous block during therapy that reverted to normal at end of treatment. Liver function was monitored during the entire study. Liver chemistries were transiently elevated in two roxadustat-treated patients (3.3%) during the 12-week treatment period: One patient in the IV iron cohort had an alanine aminotransferase level 3.3 times the upper limit of normal at predose on day of randomization; this became normal in a few days and remained normal while treatment with roxadustat resumed and continued for the rest of treatment period. Another patient with documented gallstones had transient elevation of total bilirubin to 1.5 times the upper limit of normal associated with elevated γ-glutamyltransferase and alanine aminotransferase consistent with cholestasis on day 14, followed by liver chemistries that returned to normal and remained normal during roxadustat dosing in the rest of the study. No case met Hy's law for liver injury. A total of 12 serious adverse events were reported in seven patients (11.7%) (Supplemental Material). Two patients died: one during treatment and one during follow-up. Both deaths were determined by the investigators as unrelated to roxadustat. A 67-year-old patient receiving PD with a long history of hypertension was found dead at home (suspected cause: acute heart failure) 5 days after last roxadustat dose taken on study day 26. A 75-year-old patient in the no-iron cohort with a history of hypertension, ischemic and congestive heart disease, and cor pulmonale from chronic obstructive pulmonary disease responded to initial therapy; week 8 Hb levels were 10.4 g/dl (dose of 1.33 mg/kg). The patient was hospitalized on day 72 for worsening heart failure and began receiving warfarin for atrial fibrillation. Last roxadustat dose was given on day 84 (end of treatment). On day 85, the patient's Hb dropped from 9.9 to 5.5 g/dl from acute gastric ulcer bleeding, which led to two red blood cell transfusions. Despite these transfusions, acute myocardial infarction occurred on day 89. The patient died the next day. This phase 2 clinical trial is the first reported Hb correction study with an oral HIF-PHI in erythropoietin analogue–naive anemic incident dialysis patients. The HIF-PHI roxadustat increased mean Hb by ≥2.0 g/dl within 7 weeks of treatment, independent of baseline Hb level, iron-repletion status, iron supplementation regimen, inflammatory status (CRP), and dialysis modality, while it reduced hepcidin levels, thus increasing iron availability for erythropoiesis. A greater Hb response in the cohorts receiving supplemental iron (to similar extents with both oral and IV iron) than the no-iron cohort was observed in the last 4 weeks of the treatment period, during which roxadustat doses did not differ among cohorts. An iron-replete state (criteria: TSAT ≥20% and ferritin ≥100 ng/ml) before and during treatment is a requirement in patients with CKD treated with erythropoietin analogues, in whom the large IV iron doses often lead to TSAT and ferritin levels above the upper limit of normal. Overall, roxadustat reduced hepcidin levels after 4 weeks by >50% in the EE patients. The magnitude of reduction was greatest in HD patients who received no exogenous iron (80%) and least (41%) in HD patients receiving IV iron supplement. This suppression of hepcidin in concert with roxadustat-induced increases in transferrin, which increase iron-binding capacity, may explain the sufficiency of low-dose oral iron for anemia correction. Statistically significant reductions of hepcidin levels by roxadustat have also been observed in healthy volunteers (FibroGen, Inc., data on file) and nondialysis patients with CKD.12 Lower hepcidin levels foster increased intestinal iron absorption and macrophage iron release unto transferrin, thereby increasing iron availability.7 Increases in transferrin levels likely foster adequate iron delivery to the bone marrow, as evidenced by maintenance of normal reticulocyte Hb content in the oral iron cohorts. The lesser hepcidin reduction in the IV iron cohort at end of treatment, as well as the large post-treatment increase (by end of study), not seen in the other two groups, is likely attributable to competing feedback loops by higher circulating iron levels. This difference in hepcidin temporal profile suggests that IV iron disrupts normal iron regulation and suggests a potential safety advantage of HIF-PHI by minimizing iatrogenic iron overload from IV iron. Finally, roxadustat-induced Hb response is independent of baseline CRP levels. This suggests that roxadustat may be effective in some patients even when the inflammatory component of CKD20,21 is present. No cardiovascular safety signals and no sustained liver enzyme elevations were noted in roxadustat-treated patients. In dialysis patients in the United States, the risk of death is highest during the first few months after initiation of dialysis (about 40 deaths per 100 patient-years).22,23 Similar results were recently reported for the European Union.24 In the current study, performed predominantly in Russia, only 11.7% of patients reported ≥1 serious adverse events, and 50% reported ≥1 adverse events. This compares favorably with the 20-week darbepoetin (NESP) study 211,15,16 of incident dialysis patients in which 41% of darbepoetin-treated patients and 35% of patients in the epoetin alfa comparator group had serious adverse events, and 98% with darbepoetin and 100% with epoetin alfa reported ≥1 adverse events. In the same study, 42% of darbepoetin- and 29% of epoetin alfa–treated patients were reported to have had severe, life-threatening, or fatal treatment-emergent adverse events, compared with 10% in the present study. However, our study was not powered for safety and to determine significant differences in safety profiles between roxadustat and erythropoietin analogues, very large global phase 3 studies with roxadustat are under way. These studies will enroll up to 7500 patients between the predialysis CKD and ESRD populations. Roxadustat’s ability to increase Hb is similar to that of darbepoetin versus epoetin alfa, each with IV iron, in the NESP study discussed above.15,16 The transfusion rate of 3.3% with roxadustat, compared with 27% with darbepoetin and 16% with epoetin alfa, suggests that dialysis patients receiving roxadustat may require fewer red blood cell transfusions than those receiving erythropoietin analogues, but only the large phase 3 studies will answer this definitively. In summary, to our knowledge this study is the first proof-of-concept that roxadustat, an oral HIF-PHI, is able to correct anemia in incident dialysis patients with ESRD. Roxadustat corrected anemia equally well with only moderate oral iron supplementation as with IV iron. There is no evidence that iron-replete status, as currently defined, is required. This also appears to be the first reported clinical study to show hepcidin reduction by HIF-PHI with no iron as well as oral and IV iron supplementation. Further development in adequate and well-controlled phase 3 studies is underway (NCT02052310). This study was conducted in the United States, Russia, and Hong Kong in accordance with the Declaration of Helsinki, in patients with signed informed consent, following approvals of the ethics committees. Key eligibility criteria included erythropoietin analogue-naive patients with ESRD who began receiving dialysis between 2 weeks and 4 months before enrollment, with baseline Hb values ≤10.0 g/dl, ferritin levels of 50–300 ng/ml, transferrins saturation levels of 10%–30%, no IV iron therapy within 4 weeks before randomization, and normal liver function (see Supplemental Material). 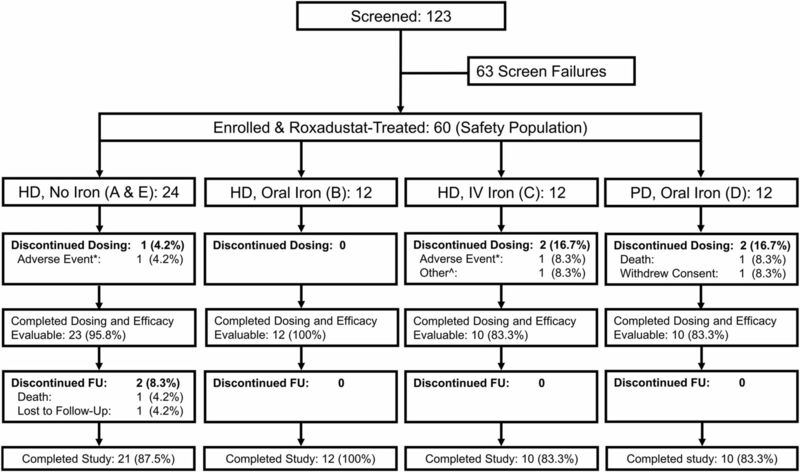 Initially, 36 HD recipients were randomly assigned into three roxadustat-treated cohorts differing in iron supplementation for a 12-week treatment period: no iron, oral iron, or IV iron supplementation (cohorts A, B, and C, respectively). Randomization was stratified by baseline iron status (TSAT ≥20% and ferritin ≥100 ng/ml versus TSAT <20% or ferritin <100 ng/ml). 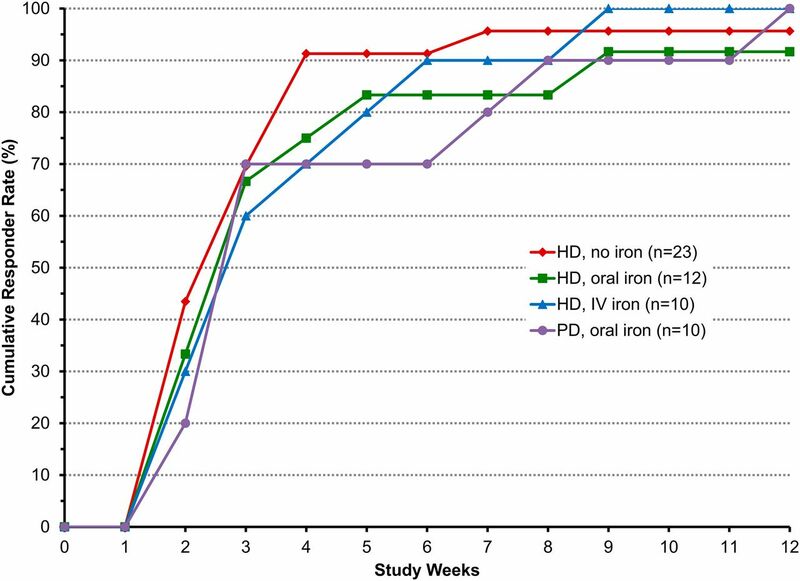 Twelve patients receiving PD were enrolled into cohort D in parallel and received oral iron. An additional 12 HD patients were enrolled into cohort E after the first 6 weeks of data from cohorts A, B, and C had been evaluated in order to further confirm or refute the feasibility of no-iron supplementation (Figure 1). Roxadustat was dosed thrice weekly for 12 weeks. Initial doses (1.0–1.7 mg/kg per dose) for the first 4 weeks were determined using three body weight tiers, followed by dose adjustment evaluations every 4 weeks based on Hb, to a maximum of 2.5 mg/kg (Table 2). Local standard of care was implemented during 4 weeks follow-up between end of treatment and end of study. Safety and efficacy data were collected weekly during the dosing period and at 2 and 4 weeks after end of treatment. Safety assessments included vital signs, physical examinations, treatment-emergent adverse events, serious adverse events, and complete blood counts and chemistries. The primary and secondary efficacy analyses were based on the EE population, defined as patients who received study drug for at least 6 weeks and had corresponding Hb data. The primary endpoint was the maximum Hb change from baseline during the last 10 weeks of the dosing period (ΔHbmax). Baseline Hb was the mean of the last three central laboratory Hb values before first study drug dose. Key secondary endpoints were percentage of patients with ΔHb of ≥1.0 g/dl (Hb response) and median time to Hb response. Exploratory endpoints included changes in iron parameters of TSAT, ferritin, hepcidin, soluble transferrin receptor, and reticulocyte Hb content. A sample size of 60 was considered adequate to assess anemia correction by roxadustat based on prior studies. Twelve patients per arm were determined by clinical judgment to be sufficient for evaluation of the effect of the types of iron supplementation. Significance of change from baseline was assessed using a paired t-test and similar nonparametric methods. Effects on Hb correction over time by iron supplementation regimen, dialysis modality, baseline iron repletion status, and baseline CRP were analyzed by repeated-measures analysis of covariance model using all available data collected during treatment. A two-sided P value <0.05 was considered to indicate a statistically significant difference. No adjustment was made for multiple comparisons. Safety and efficacy data from both no-iron-supplement cohorts were pooled. A.B., R.L., M.Z., K.S., S.H., L.P., K.H.P.Y., and T.B.N. are current employees of FibroGen, Inc., and hold stock and/or stock options in FibroGen, Inc. M.F. is a former employee of FibroGen, Inc. At the time the study was performed, A.B. was employed by the Henry Ford Health System and affiliated with Wayne State University School of Medicine. E.C., I.M., E.S., L.M.K., K.G., and D.T.M.C. received investigator grants from FibroGen, Inc. for participation the trial. FibroGen, Inc., was the trial’s Sponsor and designed the trial in consultation with the Principal Investigator (A.B.). All authors except those of the Sponsor but including A.B. contributed patients to the study. FibroGen was responsible for data collection and analysis. All authors had full access to the study data and the analyses. All authors reviewed the manuscript and signed off for its accuracy. The data reported here have been reported in part in abstract form: Besarab et al. J Am Soc Nephrol 23: 428A, 2012; Besarab et al. J Am Soc Nephrol 24: 91A, 2013; and Besarab et al. J Am Soc Nephrol 25: 304A, 2014. See related editorial, “The Dawning of a New Day in CKD Anemia Care?,” on pages 968–970. This article contains supplemental material online at http://jasn.asnjournals.org/lookup/suppl/doi:10.1681/ASN.2015030241/-/DCSupplemental. The Dawning of a New Day in CKD Anemia Care?